Considering that there can be changes after the May 9 Elections, there's going to be changes. 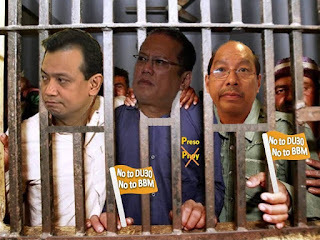 Boysen Inc. has decided to offer contracts for Antonio Trillanes IV, Nobita Aquino and Butcher Abad as Boysen models. Aquino called the opportunity to appear at a Boysen Commercial a great victory for Daang Matuwid. The following Boysen Commercial was the basis for Trillanes, Aquino and Abad. To endorse Boysen for the 2016 elections, all three of them posed for Boysen. Trillanes' reasons were to get his Vice Presidency, Aquino wanted to endorse Mar Roxas as his successor and Abad wants to continue DAP even when he's no longer in charge of the Department of Budget and Management. Stay tuned for further developments on the three new Boysen Models.